Summer is moving on and I continue to clean out my comment box. 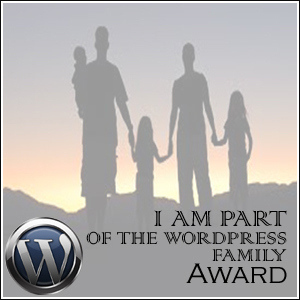 Another award I have received in the past year has been the WordPress Family Award. This award acknowledges the bloggers who have had an impact on a blogger’s WordPress blogging experience. I would like to thank Sonel at Sonel’s Corner and Scrapydo at Everything Crafty for passing this award on to me. Each day that I blog, I come across posts that are interesting, photos that blow me away, and thoughts that make me think a little about this experience we call life. In nominating the following people for the WordPress Family Award I am thanking them, not only for the creativity of their posts, but also for the support they give me in my blogging. These are bloggers who have taken the time to encourage me, to give me that pat on the back, and whose gravatars I often see in my comments. T.B.Markinson from Making my Mark who has just published her first book. These blogs are only a part of my WordPress family. As time passes, I get to know more people through WordPress, and they become a part of the group of people I communicate with each week. Congrats on getting this award, well done. I hope you enjoy the blogs that I have linked to. Hooray for me … so thank you. I invite your readers to stop by as I interact with comments. And you do that so well Frank. If they do they are sure to enjoy your snippets of music, humour, and down to earth demeanour. Colline, I came here to pop in and say hello and find this?! Oh my, thank you for the award and for thinking of me♥ You and Sonel are just the best….such caring people. It makes it such a treat to be associated with the both of you.Have a great weekend. CONGRATULATIONS! I am honored to be nominated as well. I could not forget you as your inspiring posts were the ones that came to mind when I thought of this award. Glad you could find some other blogs to read. The best part of accepting these awards is sharing the blogs I enjoy reading. Congratulations! You are truly an inspiration to me! CONGRATS. Will check out the blogs. Thank you Norma. I hope you find a blog you will enjoy. Congratulations, Colline. You and your blog are certainly deserving. Thank you John. I am always honoured when someone puts me among their nominations. It feels good and comforting to belong to a blogger family. The enouragement and support inspires us to create some beautiful for ourselves and others. Congrats. Thank you for sharing this. Stay blessed my friend. And thank you for the inspiration you give so many each week. Thank you – though I can’t really take credit as I did not begin this award. Not a surprise at all that they thought of you Colline. Thank you for the compliment Jo. Congrats, Colline, for your award! Thank you, for to give me a nice description in your list!